Is there a better alternative to FreeBanjoNotes? Is FreeBanjoNotes really the best app in Miscellaneous category? Will FreeBanjoNotes work good on macOS 10.13.4? FreeBanjoNotes helps you find the notes on the banjo in any notation! Learn and improve sight reading skills using this app just a few minutes each day. The app has 2 modes: Notes Explorer and Notes Trainer. 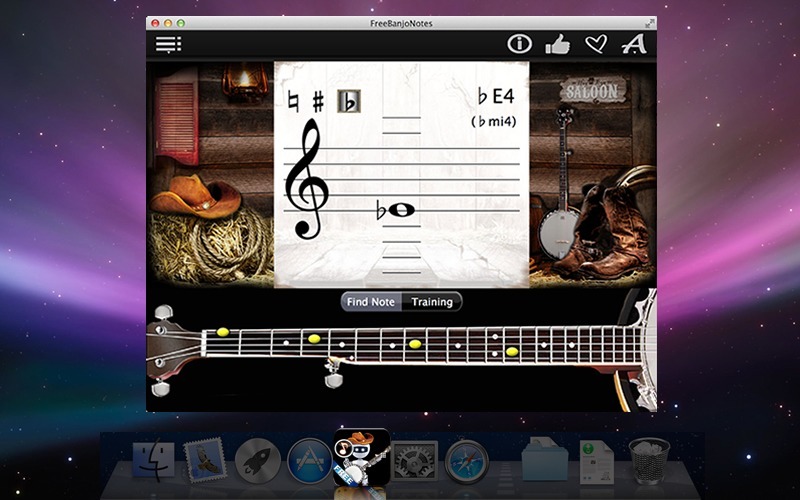 The Notes Explorer lets you find the music notes on an instrument in interactive way! When you point to a note on a virtual page, the app will show you where this note is on an instrument and the other way around, if you click instrument, you will see the corresponding note and hear the sound it makes. FreeBanjoNotes needs a review. Be the first to review this app and get the discussion started! FreeBanjoNotes needs a rating. Be the first to rate this app and get the discussion started! The Notes Trainer asks for the notes, showing you the locations, and offers the full statistics to show where you are making mistakes, so you can measure progress in sight reading and see when you've exceeded your personal best.